One of the panels I was most looking forward to on the latest edition of London’s MCM Comic Con was Humans’. I only just recently started watching it, and I got addicted half into the first episode. I was initially drawn to it because of Colin Morgan, seeing that I am a huge Merlin fan, and because of its appealing plot -but let’s not forget it is based on a Swedish show. 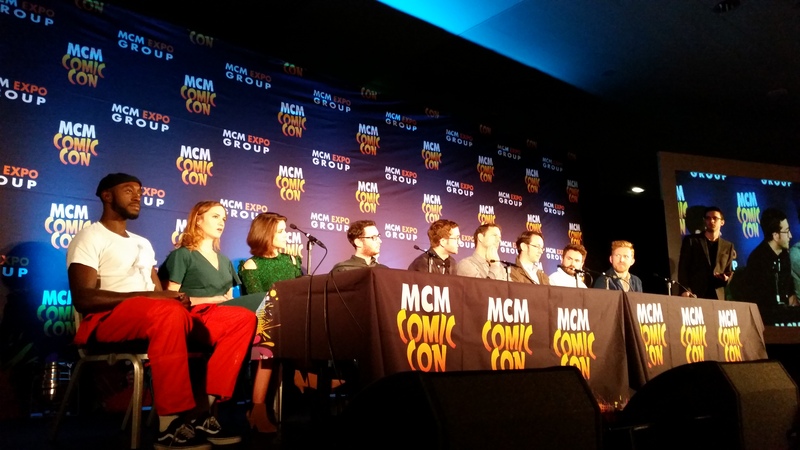 Alas, the panel did not include Gemma Chan or Morgan himself, but we attendants were lucky enough to enjoy the presence of Ruth Bradley (Karen), Ivanno Jeremiah (Max, one of my favourite characters), Tom Goodman-Hill (Joe) and new addition Sonya Cassidy, along with the show’s creators, writers and Channel 4’s Head of Drama. We got to see an extended trailer and two exclusive scenes from season two, and Cassidy introduced her character, Hester, by explaining that she is a sentient Synth that has been created in a factory. One of the things we got to see in the preview is that Joe will lose his job, and Goodman-Hill explained that on the new season, we will see Joe and Laura trying to start over, but things won’t go to plan. Another new addition that we got to see in the preview was that of Carrie-Ann Moss (Matrix), who will play an American scientist who works on the Synths. In fact, her scenes are set in San Francisco, which, as the creators explained, will help give the show a more globalised feeling, to see how this Synth issue evolves in other parts of the world. Oh, and we were also promised that, if we watch Humans instead of Poldark, Colin Morgan will take his shirt off in a future episode. Don’t know, decisions, decisions. Can I watch one and record the other for later? Humans returns tonight to Channel 4 at 9pm.